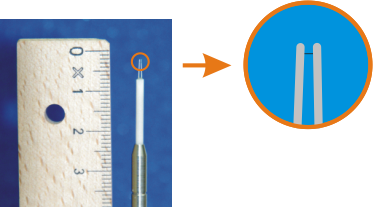 measured with a resistance thermometer in form of an even thinner (1µm) wire, see picture below. The resistance is directly proportional to temperature. Due to the small heat capacity of the wire, a high resolution and a quick response time can be achieved. Both sensors are sampled with 8 kHz which corresponds to a vertical resolution of less than a millimeter, assuming a mean ascend rate of 5 m/s. To distinguish whether a given sensor might be affected by gonola-induced turbulence, local flow direction relative to the gondola was recorded with a wind vane. Additionally sensors for attitude measurement and housekeeping were on board. The combined instruments were far too heavy to fly with a small balloon as can be launched from Kühlungsborn. 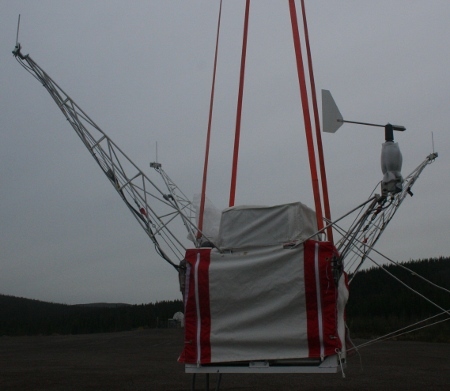 The photograph below shows the 160kg payload (another experiment was on the gondola as well) just before launch. More information on the BEXUS program can be found here (external link).